Can a Freudian reading of the Le Pen family be a key to understanding tomorrow's French election? Jen Izaakson asks. Overcoming castration: what happens when we get what we most desire? Depending on the relation to our structures of mind, it can be catastrophic. Much has been written about fathers and fascism, ever since Theodore Adorno conceptualised the germination of fascism as psychologically relying on the submission to – and the continued unconscious presence of – an authoritarian father. Adorno wrote how the father is inaugurated in the mind not just as a terrorising object but, if remote, disciplinarian or unforgiving, give shape to a self-assailing super-ego. Such a vicious super-ego results in the need to project these assaults outward onto, say, minorities or other groups castigated as weak. French colonialism was a good thing, according to the recent leader of France’s Front National. Tough medicine. Tough love. Character building. What specifically does this have to do with fathers? The super-ego is decisively not the paternal function, its role more directly related to madness (psychosis) and that’s how it bears uniquely on Front National Presidential candidate Marine Le Pen. For Freudians, the paternal function does not actually have to be a literal father, but rather a ‘third’ some sort. The paternal function, a pivotal psychic development, forms through any kind of consistent prohibition, negation or ‘no’. Sometimes it is the mother left to be the disciplinarian or arbiter of reality within families: to let children know what is possible, but critically also what is not possible. On France’s political stage fifteen years ago Jean Marie, the senior Le Pen, made it to the second round in the French general election of 2002, but lost the final vote. Impossible for him, perhaps not for her. But can our own psychic landscape accommodate that? There’s the idea of a dead father and then there’s murdering him yourself. There are relatively finite terms of reality we all navigate: no one can be age seven forever. None of us can get everything we want. Not all decisions are reversible. Consequences exist. How we understand these amounts to our ‘grip on reality’, or more psychoanalytically worded, our sense of Self in relation to the world. An election candidacy that your father failed in previously very clearly puts at stake the existing psychic order of things. Fail and you are him, unusual enough, but win and you are successful replacement, exceeding him in the eyes of the world. Freud’s Totem and Tabboo explained this paradoxical possibility: the advent of a tribe murdering their tribal leader, their father, and the guilt and horror afterwards. You might wish to overcome your place in the structure, but once you do, all previously established meaning is abolished. Psychoanalyst Rosine Perelberg’s book Murdered Father, Dead Father uses Auschwitz as a model of the world of the murdered father: a psychotic universe. 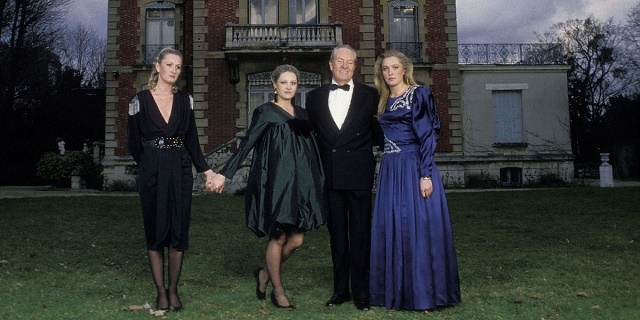 Marine Le Pen’s potential exists to not only become President of France, but in doing so, exceed her father on precise personal and political terms of their own family drama: fascism rising in France and the Le Pen’s Oedipal scene coincide. But are they similar figures? How closely following in the father’s shadow are the daughter’s footsteps? 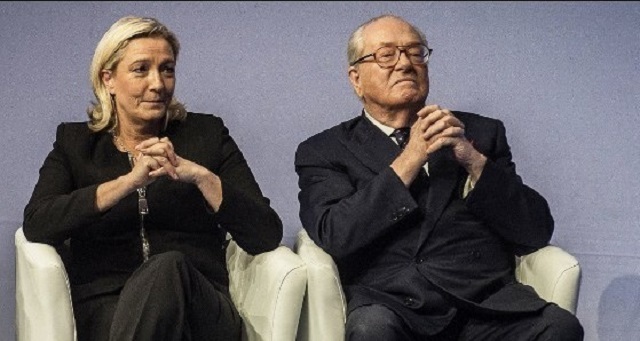 Le Pen Sr. has been estranged from Le Pen Jr. since 2015 when she played a pivotal role in expelling him from the Front National for making anti-Semitic comments. She has called their feud, “the hardest time of my life except childbirth”. Marine Le Pen’s childhood was marked by her father’s politics; as an 8-year-old girl her home was hit by a bomb meant for him. In the last televised Presidential debate Le Pen stated, “Why would you [Macron] go to Algeria and accuse France of crimes against humanity?” a war her father committed torture during. Though the father called the holocaust’s gas chambers, “a detail of history’, the daughter had her own minor version of holocaust revisionism in denying French responsibility for the Vel’ d’Hiv Round-up of July 1942, wherein 13,152 Jewish Paris residents were rounded up in the Winter Velodrome, approximately 4000 of them children, with almost all sent to extermination camps and killed. Is it possible for Le Pen’s political trajectory to have this relation to her father? Freud postulated little boys have an unconscious wish to kill their fathers and marry their mothers (and little girls to murder their mothers and possess their fathers), named after Oedipus, the King in Greek mythology. This was later extended, developing away from the early normative model towards an open Oedipus complex by 1911’s essay Leonardo Da Vinci, A Memory of His Childhood. Da Vinici was raised by a single mother and was speculated to have been gay. In this respect Freud theorised Da Vinci remained both heterosexually loyal to his mother as the only woman he would ever love, but also, Freud suggested, identified with her in his romances with men. Oedipus requires no particular formula, therefore it is perfectly credible that Le Pen wishes to supplant her father despite her status as a woman. Le Pen is in fact, as we all feel it, retrospectively addressing a universal castration fantasy. Castration means the inability to satisfy or realisation of limits to our powers or capacities. If Le Pen succeeds on Sunday night she will have overcome all measure of foreseen possibility, outstripping her father and family expectation: unseating him at the family dinner table once and for all. This is one reason her campaign, like Trump’s and popularism generally, is so exciting. Defying what we are told is possible, pushing against the limits of reality. There is no frightening outright chaos, but we feel the terms of what is allowed being reassembled. Le Pen Jr. has stated she expects her father to telephone if she wins the Presidency, almost as if she knows such success will render him eclipsed. Telephoning in an attempt to maintain relevance or remind her he is still alive: she has not fully killed him off yet. The crux of the problem emerges: once your object of desire is obtained, what is left? Where does desire have left to go? Of course, the simple answer is it transforms towards a new object: a second term in office, a different lover, a greater literary legacy, a better house and so on. What might cause real trouble for Le Pen Jr. is that her desire is so tightly bound up with her father. Once he is no longer the linchpin of political destiny, once she replaces him and annihilates his structuring force in her mind, it could send meaning into freefall. What does it matter anyway? Well, as the speculation over Donald Trump’s states of mind indicates, the psyche of political leaders affects their decisions; decisions the mass populace has to suffer. In an election wrought with Freudianism – let’s not forget Macron is married to his own symbolic mother figure, his former school teacher, a decade and a half older than him – the relation of fascism to authoritarian fathers should make us take up the questions of why it is that fervently patriarchal family units reproduce themselves in such politically violent ways. Jennifer Izaakson is a member of Momentum and PhD student at a London university. Jen writes for the Huffington Post and Tweets @isacsohn.